A special Thank you to Cedar Fort and NetGalley for sending me this book to review. When Anne broke off her engagement seven years ago, she thought she’d never see Neil Wentworth again. But when Neil’s brother buys the house she grew up in, it seems fate has other plans in store, and Anne is woefully unprepared for the roller coaster of emotions that accompanies Neil’s return. Fans of Persuasion will love this fast-paced, modern retelling of Jane Austen’s most romantic novel. I adored this book. Utterly, posilutely, LOVED IT. Rebecca H. Jamison has crafted a great set of modern characters and circumstances to complement Jane Austen’s classic storyline. But truth be told, I really think this story was strong enough on it’s own to be marketed completely separate of the Persuasion title. Call me simple-minded, but if I hadn’t known this was the Persuasion story line I wouldn’t have guessed it. I would just gone with it being a really captivating love story, it was that good. Stockbroker Anne is a well-rounded character with depth, soul and great convictions and Policeman Neil is a strong, principled man; a gets-the-job-done type with a gentle soul. The supporting characters are believable and really give the reader great insight into Anne’s motivations. This tale of forgiveness, of giving understanding and of falling in love all over again will melt your heart. 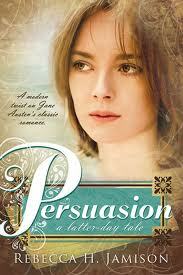 Christy, Persuasion is my favorite Jane Austen novels! I'm definitely going to have to check this out! Thanks for the review, Mary. I'm glad you liked it.